Joe Blogs: I will have my vengeance!! 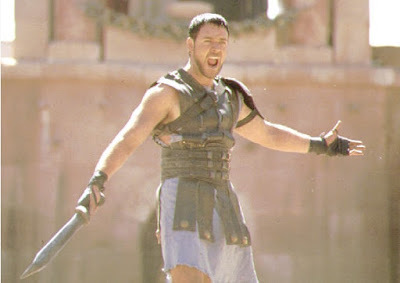 Watched Gladiator last night and what an epic movie, I have seen it a few times before but it's an amazing movie. My name is Maximus Decimus Meridius, commander of the Armies of the North, General of the Felix Legions, loyal servant to the true emperor, Marcus Aurelius. Father to a murdered son, husband to a murdered wife. And I will have my vengeance, in this life or the next. Even though I have seen it before and know the outcome the part where he is reunited with his family still makes me sad. I imagined my son saluting me with pride although with the scenario I feel so distant from him. My daughter and I have a close bond I feel and nothing will get in the way of that as she won't have a bad word said against me. My son I feel for as long as he can remember won't recall me living with them and although I try to build relations seeing them for limited periods has boundaries. I suppose I just have to do my best especially as the main man in his life is his mother's boyfriend and he will relate to him more. I haven't held a 'reasonable' conversation with her bloke other than when he was showing off but going to Amsterdam for Christmas they weren't going sight seeing so I expect he is no better than her. Plus with my daughter saying she was left at school recently with no one to pick her up and my children's increased aggression I am concerned. I don't see what goes on behind closed doors so I can only speculate. Anyway they are back in school today so they will be back in their routine at least. In other news today the Consumer Electronics Show is taking place and although I was expecting the news on the Microsoft Surface I am interested in it more than ever. Thinking of the possibilities in terms of work and possibly a DJ platform. Sharing information and the like seems so easy and I hope this becomes available although it will probably cost a years wages! There was also details on mobile technology and an announcement that Microsoft and BT are to provide a service like Vision which runs through the Xbox 360. Sounds good to me!! Bill Gates is stepping down from being the main person at Microsoft this year and this is his last Keynotes and it's worth checking out and the full footage is available here! !